p.s. : check out more Wordless Wednesday here! hahah our cat does the SAME thing!! Aww, so cute! 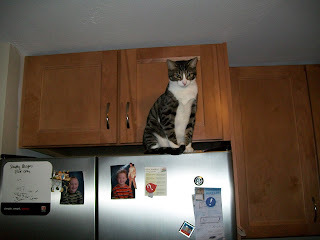 My cats are not great jumpers (thank goodness) so they don't venture up too high. That's funny! I'd be scared that he'd jump on my head as I walked by. Laurie, haha nope! He's too busy knocking my magnets down! He will sit on my dresser and jump on my back if I lean over to pull a drawer out! Then I have to walk hunched over around the house screaming for my husband to get him off me!